So this is apparently a real thing from the Wall Street Journal. The Onion couldn’t top this. Whether it’s the sad faces of all these put-upon dejected rich people, or the elderly minority couple who is depressed despite not paying extra taxes (or was that the point? ), or the distressed single Asian lady making $230,000 who might not be able to buy that extra designer pantsuit this year, or the “single mother” making $260,000 whose kids presumably have a deadbeat, indigent dad just like any other poor family, or that struggling family of six making $650,000 including $180,000 of pure passive income and wondering how to make ends meet, mockery is almost superfluous. The thing mocks itself. That $650,000 family in particular is bizarre to the point of incredulity: those people could literally stop working entirely, live extremely well on $180,000 while doing nothing but watching television all day and staying home with their kids, and leave their high-salary jobs with their oh-so-onerous tax requirements to people who actually appreciate them. This is astonishing, and exactly the kind of thing that enables people earning two hundred thousand dollars a year to think they are ‘poor’ or ‘middle class’. 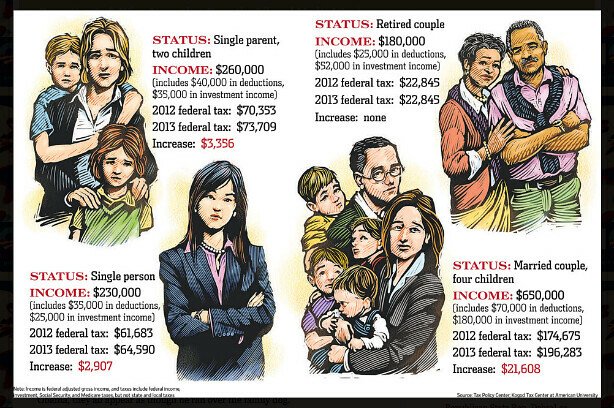 Holy hell, these cartoons would make more sense if the incomes mentioned above were all cut to 1/10th shown. But then the tax increase wouldn’t be there, and the WSJ would have nothing to report on, would they?